I bought these new 6 oz. ramekins at the store for a blackberry dish, but I always have frozen peaches on hand and thought I’d try this first. They worked great! Anchor makes them. It’s neat to see the filling through the dish. But anyway, I’ve made a few peach crumbles and this one is by far the best I’ve tried. I even lowered the sugar and fat in it to see and it was still just as tasty! This is another hit from Ina Garten. I think her show is sometimes kind of annoying, but when she makes a recipe she really hits a homerun. I’m sure this could be made in a larger dish instead of individual dishes. Simply increase your baking time. 1. Preheat oven to 350 degrees. Prep 4 – 6-8 oz. ramekins or small baking dish and spray with cooking spray. In a medium bowl, mix the peaches, zest, juice and sugar. 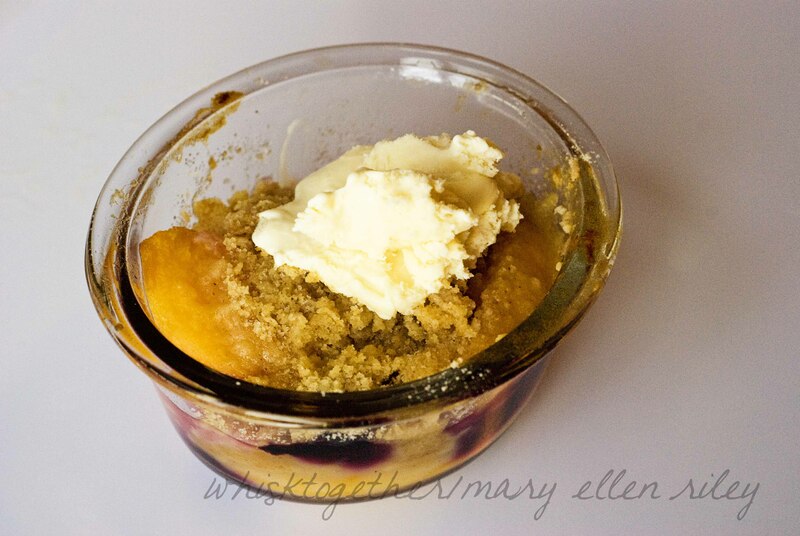 Fold in the blueberries and let sit for 5 minutes while you make the crumble. 2. 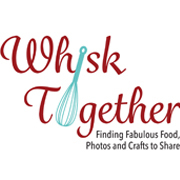 In another medium bowl, whisk together the flour, sugar, brown sugar, salt and cinnamon. Cut in the butter using a pastry cutter or your fingers until it is coarse and crumbly. 3. 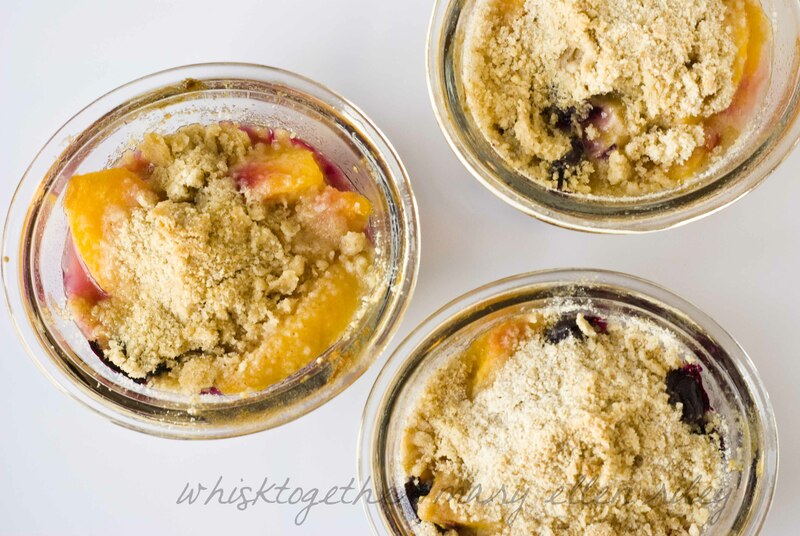 Distribute the fruit mixture into the baking dish or divide evenly between ramekins. Top with the crumble. Bake 35-40 minutes for ramekins, check after 45 minutes for a baking dish. The top will just start to brown and the filling will be bubbly. There aren’t any eggs- so this is pretty forgiving on time. If you use the reduced amount of butter, the tops won’t brown as much because of the lack of butter. But they are still yummy and pretty. 4. Cool slightly and eat! Topped with vanilla ice cream is good, too.